The hardest thing about this recipe was choosing the name. Pepper or capsicum? Aubergine or eggplant? Whatever my choice I knew it wouldn’t resonant immediately for all readers – because confusingly these two everyday vegetables have multiple names. The pepper is to the British what the capsicum is to Indians, Aussies and Kiwis. To complicate matters more in America it’s usually called a ‘bell pepper’. And, whilst in American and Australian stores you’ll come across eggplants the Brits and French call this vegetable the aubergine and in India its known as brinjal. Confronted with so many choices I landed on Aubergine & Capsicum Relish. 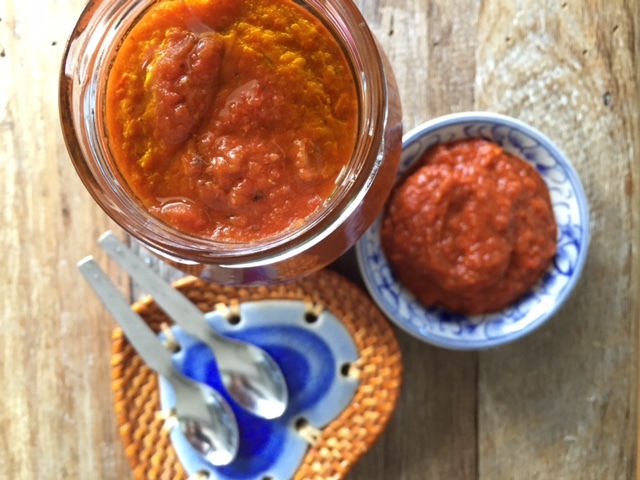 Putting the name aside as long as you can get your hands on both vegetables you can prepare this versatile relish – it’s free of added sugar and is packed with beta-carotene, vitamin C and fibre . 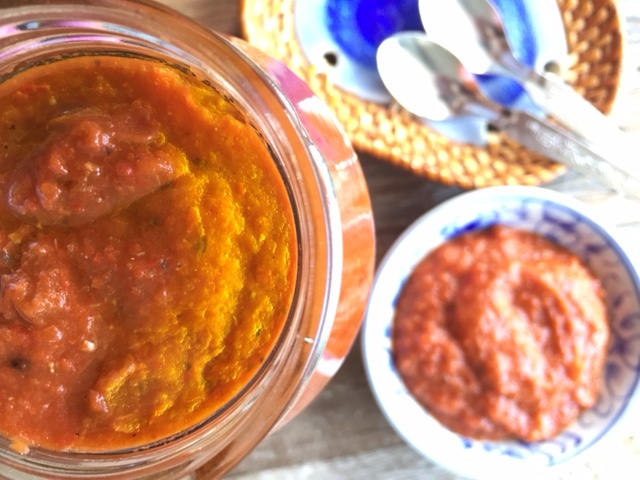 It works well on sandwiches, with grilled meat and fish and even doubles as a dip. Pre-heat the oven to 200C. Using a fork prick a handful of holes in the aubergine skin. Place the aubergine and capsicum on a baking tray into the oven. Remove the capsicum after 30 minutes or when the skin is turning black. Place in a covered bowl to allow it to sweat. Remove the aubergine after 45 minutes or when it’s totally soft right through to the centre. Place in a colander over a bowl and allow to drain. Peel the skin from the capsicum and remove the seeds and inner core. Remove the flesh from the aubergine. Place the capsicum and aubergine flesh in a bowl or food processor. Add the garlic, cumin, salt & pepper. Blend to a purée whilst gradually pouring in the olive oil. Once smooth transfer to a sterilised jar. To quickly sterilise a jar wash in soapy water and then place in a pan of boiling water for 10 minutes or place into an oven on 120C or higher. Tags: aubergine, brinjal, capsicum, dip, eggplant, Fiesta Friday, pepper, recipe, relish, sauce. Bookmark the permalink. I do like a good relish! Such a great accompaniment to cheese and cold meats. I like the idea of combining egglant and capsicums too. Thanks Kay and yes me too…. 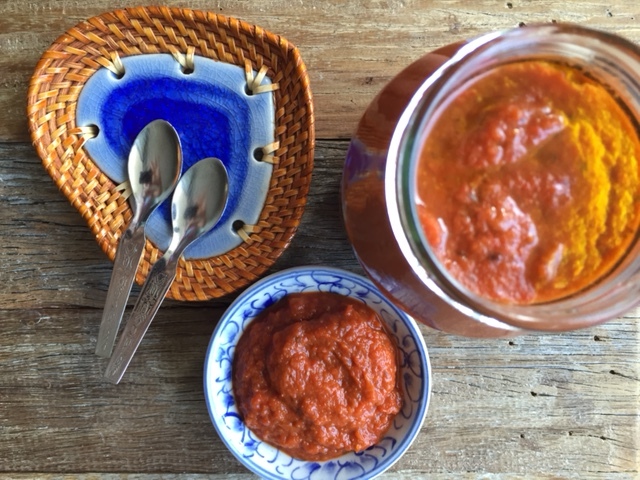 Thanks Caroline – in that case you must try this relish! Yuuuum! This looks so good!